Your business credit score is one of the most important factors that lenders consider when qualifying you for a business loan. The lower your score, the harder it will be to get the financing your business needs, and with so many variables that affect your score, it can be difficult to keep up. So what can you do as a business owner to improve your business credit score? Business Credit Score and Personal Credit Scores are 2 Different Things! Everyone knows about the 3 major reporting agencies for their personal credit. What most business owners don’t know is there is a completely separate report that is strictly for your business accounts, equipment loans, accounts payable ect. When applying for an equipment loan a lender will look at this along with the personal credit score. This could have an impact on whether or not you get approved. Building business credit is key to getting future business loans and financing equipment and you should only work with a lender that reports your equipment loans to your business credit. Late payments are bad news for credit scores. A few late payments can do significant damage, so it’s important to make sure you pay on time. If possible, you should aim to make your payments early, as this can help your credit score in the long run. Some credit bureaus will assign a perfect credit score to those that pay early, so it’s worth getting those bills paid before the due date. Your business credit report will detail both your payment history as well as any public filings associated with your business, like bankruptcies, liens, etc. Some lenders will consider these filings as grounds for immediate disqualification, and they often stay on your credit report for years after they occur. It’s in your business’s best interest to ensure that you don’t end up in this kind of financial turmoil. Aim to borrow from a lender that reports their receivables to credit bureaus. If your business is making your payments on time, this reporting can actually help boost your business credit score. Though many lenders do report to credit bureaus, there are a few that do not, so make sure to do your research on the lender you plan to use. Building good business credit can help you in more ways than just securing a loan. It can lower your interest levels, bring in new customers and help your business standout as trustworthy and reliable. These factors and more make it even more important to do what you can to keep your business credit score as high as possible. 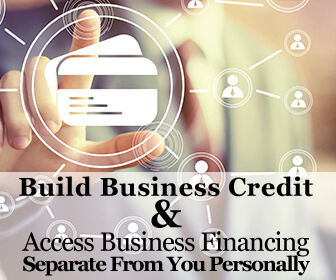 We at Axe Business Funding only do business loans so we don’t impact your personal credit at all. This is a loan for your business and it should be under your business.